Celebrate Earth Day and spring by welcoming songbirds into your yard! Cranmer Earth Design’s Hexagonal Bird House attracts wrens, chickadees and nuthatches, which will help bring life to your garden, eat insect pests and bring you the beautiful sounds of nature. Once it is finished with Vermont Natural Coatings PolyWhey®, the birdhouse is protected while providing a safe, non-toxic environment for the nesting birds inside. 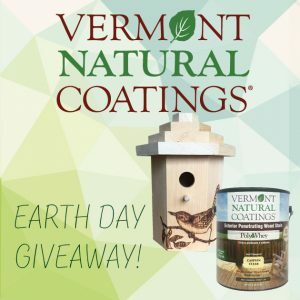 Enter the Vermont Natural Coatings Earth Day Sweepstakes for your chance to win a Cranmer Earth Design Bird House and a quart of Vermont Natural Coatings Exterior Penetrating Stain. Apply the Exterior Penetrating Stain to the bird house to protect it from the elements! The sweepstakes begins on Friday, April 7, 2017 at 12:00pm EDT and ends on Friday, April 21, 2017 at 12:00 PM EDT. All entries must be received on the form below or on our Facebook page (https://www.facebook.com/vermontnaturalcoatings).